Since we released interlock knit fabrics with City Weekend, people have been asking what interlock is and how it differs from other kinds of knits. In order to answer those questions, I need to back up and start by explaining what makes knit fabrics different than wovens. If you know a bit about how fabrics are made, you are aware that woven fabrics are comprised of warp and weft threads that are woven together. (For more on this topic, see my guest post on the BurdaStyle blog.) 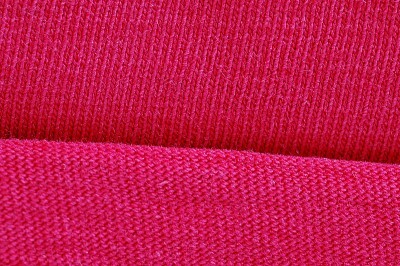 Knit fabrics are made differently. 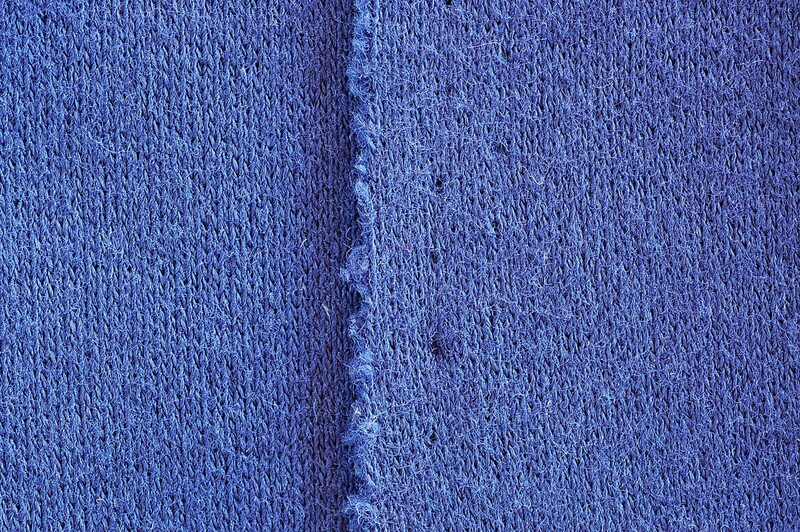 To produce knits, needles are used to to manipulate yarn into connected loops. There are two categories of knits: weft knits and warp knits. 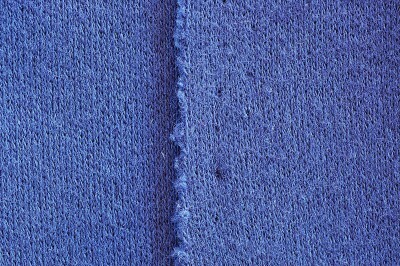 Warp knits are made using many needles and yarns. The resulting fabrics include tricot and textured knits, but since these fabrics are less commonly used in home sewing and have very different qualities than weft knits, I won’t say anything more about them in this post. Maybe someday I’ll have occasion to talk about them in more depth. Weft knits are made using one continuous yarn moving back and forth (or around on circular needles if the knit is made as a tube, like a seamless T-shirt or tights). If you are a knitter or have ever learned to knit, you might remember the four basic knitting stitches: knit (or plain), purl, miss (or skip), and tuck. These are the four primary stitches that make up most weft-knit fabrics, as well. These four stitches provide lots of versatility for knits. They can be combined to create all sorts of interesting textures and fabric types. Different yarns, thicknesses, fiber types, colors, and the tension of the stitches (how tightly knitted they are) offer lots of opportunity for the creation of a huge variety of knit fabrics. I’ll talk about some of the most commonly available knits: jersey, rib knit, and interlock, but keep in mind that many other knits are available as well. Jersey Knit. If you look at a basic T-shirt, it’s probably made of jersey. With jersey, every stitch is a knit stitch, so all the loops are drawn to one side of the fabric. The front of jersey fabric is smooth, and the back has a more textured appearance since it’s composed entirely of purl stitches, which create the appearance of a bar across the fabric. Most jersey stretches in both directions: up and down as well as across. The edges of jersey have a tendency to curl, which can make sewing and hemming it rather tricky. Jersey does, however, take prints well because of its smooth surface. Rib Knit. Think back to that jersey T-shirt we were imagining earlier. The neck band is probably a rib knit. 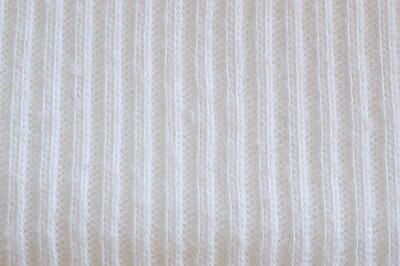 Rib is made by alternating knit and purl stitches to form ridges on both sides of the fabric. Rib knit lies flat and has more stretch in the width than the length. Rib makes great neckbands and cuffs because of this elasticity. Interlock Knit. Interlock is a variation on rib knit. 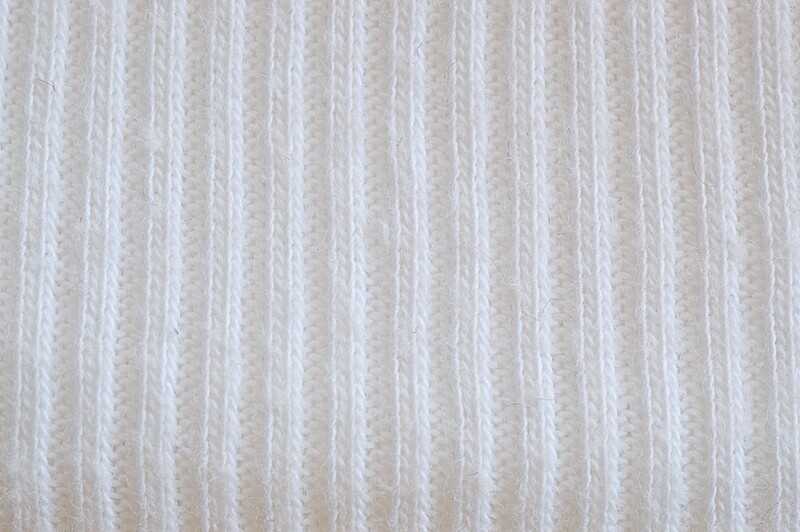 Instead of creating ridges of knit and purl stitches, interlock has two rows of stitches, one directly behind the other. This can create the impression that the fabric is comprised of two layers, which is why it is sometimes categorized as a double-knit fabric. (The two layers of interlock, however, can’t actually be separated.) Interlock is thicker than jersey, and both sides of the fabric are smooth, like the right side of a jersey fabric. Interlock is more stable than jersey, which means it doesn’t stretch out of shape as easily as jersey and it doesn’t curl at the edges. This ability to lie flat, as well as the fact that interlock take prints nicely, makes it popular for home sewing. When you’re sewing with knit fabrics, you should keep a few things in mind. You should make sure that the garment you are sewing will be one that takes advantage of the unique properties of a knit fabric. Knits mold and drape nicely over the body. They also move with the body. These properties, however, cause knits to stretch out of shape more than a more rigid woven fabric will do. Knits recover nicely from wrinkling, which means knits are easy to care for, travel well, and generally don’t require ironing the way many woven fabrics do. But because of this anti-wrinkle trait, knits also don’t take a sharp crease. For example, a knit fabric won’t hold a pleat very well. Sew a pleated garment with a knit fabric, and you’ll likely be disappointed at the results. Because of the way they are constructed many, but not all, knits have stretch. And some knits stretch more than others. It’s important to keep this in mind when you’re selecting a fabric and garment to make. 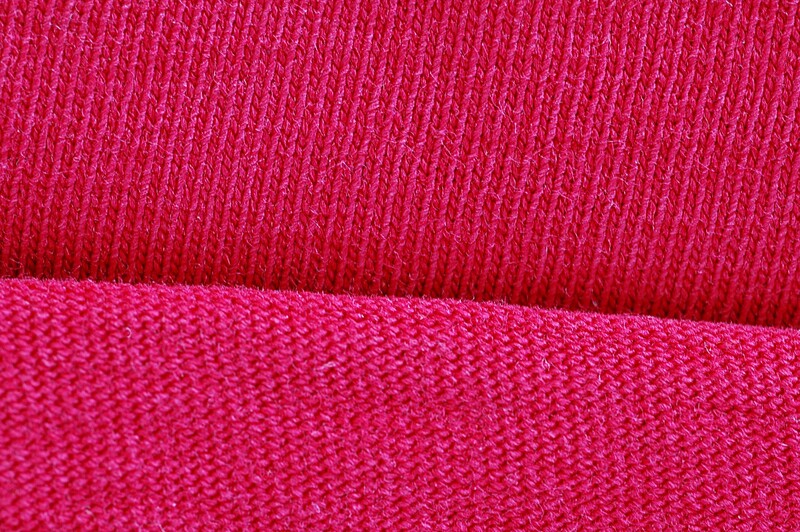 Some knits include Spandex (also known as Lycra or elastane), which gives the fabric excellent stretch and recovery (the ability to return to its original shape quickly, without much distortion). Swimsuits and athletic clothing often includes this fiber, and even a small amount will change the fabric dramatically. Make sure to check your pattern for a recommended stretch percentage (if it was written specifically for knit fabrics) and your fabric to ensure that they are in sync. Thanks-I’ve often wondered about the difference between jersey & interlock, especially since I buy mainly from the internet & can’t get a chance to feel them first! I have to tell you, I absolutely love your City Knits & so do my 3 granddaughters who all have dresses made from them! Love the prints & dots and they ooh & aah over how soft they feel! I do hope you’ll be doing some more soon! I have a couple yards of that blue stuff in the bottom picture, I think its that very same shade! Thanks for the info, now I’ll go make something with it. Thank you! That was very helpful. I am trying to learn more about knits so I can learn to sew with them better. YOU are and EXCEPTIONAL teacher, Liesl! I love posts like this, I always feel like I have so much to learn about things like this, but the information out there can be so cryptic! This is great thanks. I am scared to sew with knits, mainly because I have no idea about them! Will keep an eye out on my next trip to the fabric shop. You are great,you are really a light source for me.